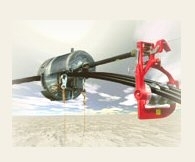 The three sheave multiple cable block can keep up to three 2 1/2 in. (63mm) diameter or smaller cables separate until you're ready for lashing to the messenger. The three sheave block is ideal for triplexing cables in the electrical industry; that is lashing up to three 750 MCM cables together to a supporting strand. The four sheave multiple cable block can handle up to four 1 1/2 in. (38mm) diameter or smaller cables at one time. Parts are available for end user replacement. All the Multiple Cable Blocks feature heat treated aluminum alloy frame and sheave, with Oilite bearings on the sheave and steel inserts on the strand hooks for easier movement. A bi-directional lever operated cam locks the block in place during pulling in, then automatically releases during lashing.